First look at the lava. Yeah, my first thoughts were like Ufol said, it's really too bright to see any details. I went looking for some screenshots yesterday to link up from the early days of Dwelvers and compare, but I couldn't find em here anymore. It would be nice to go back and see what the lava used to look like. I may have to go back and load up one of the old v0.4 versions just for fun and nostalgia sake. I dunno, I rather like the glow. I think it could be used to add some nice lighting to ones dungeon. By itself it may look strange, But in game, I think that perhaps the glow my add more than take away. It's always hard to form a solid opinion from just one screen shot. Something that looks good at one angle, might look absolutely dreadful from another, and vise versa. Rasmus, maybe you should get in the habit of taking a few screens from different angles when showing off a new feature. To me looks more like the sun more than lava. In other words a bit bright, although the sun is a decent example of a form of lava... How to put it... saturation maybe. Can't really see much detail like many of the others mention. Looks good just not enough orange spots, maybe. The hue seems fine as I like the effect it gives off on the surrounding terrain, so the edges look better than the center portion which seems to be a too much yellow I think. Well that is how I see it, but an interesting shot none the less. Now it depends we want to have magma or lava. Under the ground it's much hotter and magma is much lighter and liquid, it's not solidifying there like on the surface. In Dungeon Keeper 1 magma was something that truly enchant underworld. The evil red light on the walls and ceiling, firing up magma bombs tells you about danger and mystery. Magma was a living monster there! I think that magma or lava distinction is not as important as (almost eyeburning) glow amount. Why not to mix both types? Some brighter patches of magma on a lava lake (or vice versa). It could be determined by depth or distance from shore (or water if it fall in). Let's say one/two block wide border of lava-like liquid with it's less bright shifting cracked shell, and more in the middle of the hot pool there would be brighter magma. Plus some magma geysers distributed randomly - something have to throw that fireballs right? It would be nice to see some fiery cracks on blocks surrounding lava, and earth scorched a bit by constant heat. Another nice refference i've found - lot of hot bright lava, but not as much glow. I agree with sebt, as it is mainly the glow brightness. The lighting itself I liked, but as he pointed out as well having more area it lights up. The only thing I disliked was the brightness or glow of the lava itself. 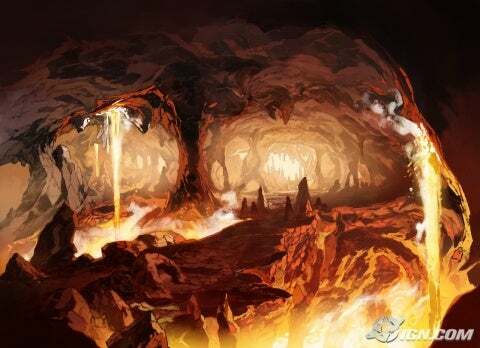 In a way it would be magma anyhow since these dungeons are made deep underground. However also like the person above me mentions, why not both. Well having the surrounding rocks with cracks and signs of decay from being near lava/magma, especially the ones right at the edge. Of course that might take a bit i would think but a good start. Working on the glow now, but I got a little sidetracked by the rock texture that is a little off atm. Nice pics Sebt and UfoL, I think I will go in the direction of the second screenshot you posted in this topic UfoL. But with wider seams of lava. (25-01-2015, 01:52 PM)UfoL Wrote: Another nice refference i've found - lot of hot bright lava, but not as much glow. That's even better picture of what I mean in previous post, lava could be a little brighter, but maybe it won't look any better, good search. Here's a blast from the past. Lava in Dwelvers 0.5; man that one was buggy one. Think it was similar to 0.8, a very quick update to the next revision. 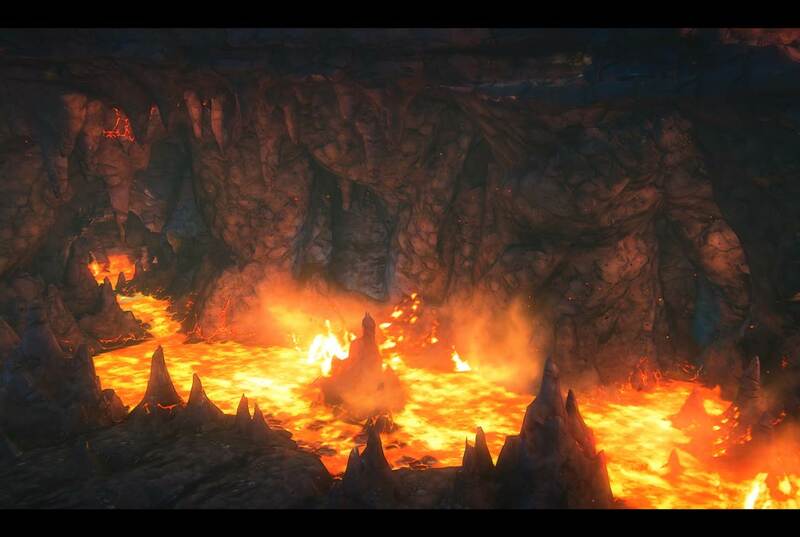 Hopefully when lava gets reintroduced to the game we won't have it directly next to water. I really liked the water shores in that version. I think I am going for a Minecraft solution that when lava and water meet they form rock. New lava look, and testing some water -> lava intersection events. In this case if water meets lava that square will turn into rock and create some steam particles and sound. When you say when they meet they make rock, does that mean it will form permanent rock like the outside walls, or will it just be a bit tougher than dirt to mine? Even better would be if it formed Obsidian. It could be used later to make better weapons. The new lava looks great by the way, but I think it should light up its surroundings a bit more. The fact you got some steam coming up there even adds to the effect. At some point it would be nice to see a bit more work done with the water to make it more realistic. I mean mechanics come first, but the angular water or how it just sits on the top layer of tiles is strange. Well I got a bit off topic there, but I can't wait to see lava back in the game. I really would like to corral my imps into it when they piss me off. I was thinking, a lot of times a rock bridge is incorporated in games to traverse lava, which we have plenty of rock. It might would be cool to have a new material available instead of rock which could be crafted to make this. In Hawaii, they surround utility poles with concrete to prevent their destruction. Making a concrete bridge would be a way to be a bit different than the norm. You could use Rock, Metal, and Water to make it.